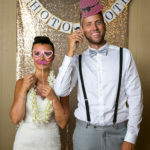 This couple decided that they wanted something extremely unique for their Hawaii destination wedding. More than just coming to the Big Island they wanted to go where very few people every get to go, to a section of the Kohala coast only accessible by helicopter or a few days hiking. They chose Paradise Helicopter to provide the transportation to the wedding site. Pastor Bruce with Grace Community Church preformed the ceremony. After the ceremony the bride, groom and the rest of the family continued on a helicopter tour of the island and even did a second landing on another remote area of the Big Island for more photos. Congrats to you both. Thanks for having me on your special day.